Get new monthly style tips directly to your inbox. Sandals with sock? Please no! The ultimate male fashion trespass. Nothing says “dorky dad” like a pair of Tevas with white socks from Wal-Mart. Wearing Uggs: Ugg, why? It’s one thing for women to step out in these, but for men, it’s a whole new level of fashion crime. The Ugg has no place in the outside world, it belongs in the comfort of your home with your terrycloth robe. Tennis socks with dress shoes: Fashion is all about the details. You may think no one will notice if you throw tennis socks under dress shoes… until you cross your legs in an important business meeting. Baggy or poorly fitted clothes: Unless you’re a 9-year-old boy who grows out of his pants in six months, there’s no reason to ever buy clothes that don’t fit right. And unless you’re a teenager from the 90s, there’s no reason to ever wear baggy pants. Pointy toe dress shoes or square toe dress shoes: Strictly speaking, this is not necessarily a faux-pas, but pointy or square toe dress shoes are a bit old school. Maybe try a more updated look with a round-tipped shoe. Wrinkled clothes: How you wear your clothes is just as important as what clothes you wear, so make sure to take an iron to your wrinkly clothes after they come out of the dryer. Remember, ladies love men who look like they know how to do their laundry! Dirty dress shoes: Nothing ruins an outfit like an ugly shoe (see above: Uggs), but even worse is an unkempt shoe. Pros keep their fancy shoes at the office and walk to work in tennis shoes, slipping the nicer ones on as soon as they get in. No one is the wiser, and you never have to worry about scuffing the leather! Too much fragrance: Isn’t it time we take a stand against the tyranny of over-scented men? How many times must we be suffocated by a cloud of Axe Body Spray before we yell to the heavens “enough is enough”!? Wearing running shoes when not running or working out: One day someone will design a shoe as comfortable as a running shoe with the appearance of a dress shoe. But until that day, running shoes are for running. Unless you’re pulling a sly move like in #7. Overly embellished jeans: This is an unfortunate trend that needs to stop. If 1980s hairstyles taught us anything, it’s that some looks do not age well. Do you really want to explain to your grandkids why you were wearing jeans with rhinestones and embroidered dragons on them? Floral Prints: Floral prints aren’t necessarily bad, but they can spin out of control easily. A floral print tie with a white shirt? Fine. A floral print shirt and jacket? Please stop assaulting my eyes. Unkempt facial hair: If you’re gonna rock the beard, you gotta make sure it’s trimmed and clean. Unless you’re going for a whole Tom Hanks in Castaway look. Then by all means, go for it. Too much hair growing down the neck: “I love a shaggy neck beard” said no one ever. Wearing sunglasses at night: The Blues Brothers pulled this off, but it doesn’t mean you can. Sunglasses at night are not only a great way to look like a frat boy, they’re also really impractical for obvious reasons. Those toe showing shoes: Noooooooooooooooooooooooooooooo. Just no. Canvas belts: There’s just no reason to make a belt out of canvas. These are an insult to the fine tradition of leather belts. Overstuffed wallets: Not only does this make you look like a nerd when you whip out your wallet to pay for something, it’s also bad for your health. Doctors will tell you that sitting with a thick wallet in your back pocket can cause misalignment in the spine. Sports sunglasses with casual or dressy clothes: Sports sunglasses are only acceptable when playing sports. They have no business on your face when you are wearing anything other than workout clothes. Hooded sweaters: We can all blame Mark Zuckerberg for the prominence of this look. The fact that he’s a tech geek who wears the same grey t-shirt and jeans every day should have tipped us all off that he is not a born fashion icon. Graphic print T-shirts or shirts with ironic writing on it: If Ed Hardy shirts are a staple of your wardrobe, you need to take a long hard look at the choices that have led you to this moment. Over the past months I have been working hard on a menswear infographic series focusing on different clothing pieces. I have featured visuals on shoes, dress shirts, suit jackets, and even briefcases and hats. Surprisingly, especially when considering my site is dedicated to tying a tie, it took me this long to feature on on ties. 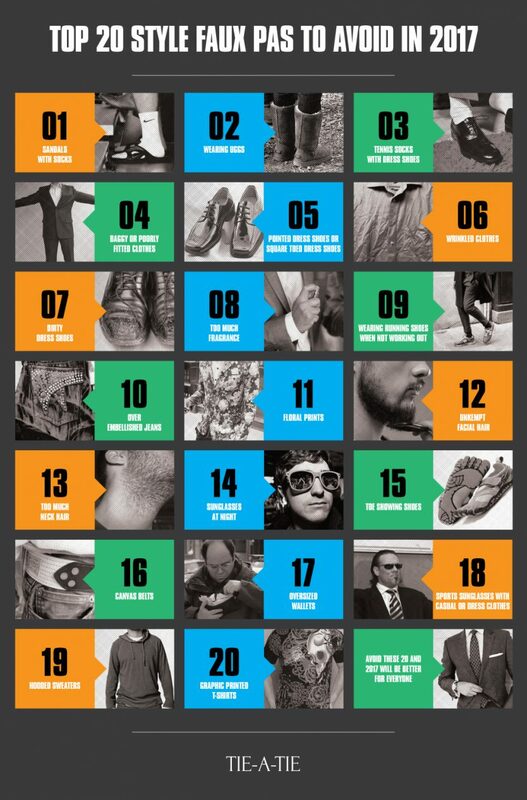 A few weeks ago I featured a fun infographic on the 50 most iconic men’s watches. While this graphic is fun and interesting to look at, I thought it does lack some important information. I therefore decided to borrow the visual layout I used for my men’s jackets and briefcase infographics, and created this new visual all about the different watch styles found in menswear. Since my past infographics on briefcases, men’s watches, as well as hats were so popular, I decided to follow the same layout to highlight another important menswear staple: the suit jacket. Below are the 8 common jacket styles found in men’s business, formal, and semi-formal attire. 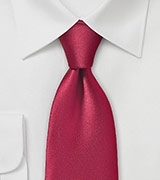 Besides showing what makes each style unique, I decided to highlight what type of neckwear to wear each jacket with, which style is best suited for business vs formal attire, as well as what common cliches are for certain jacket styles. 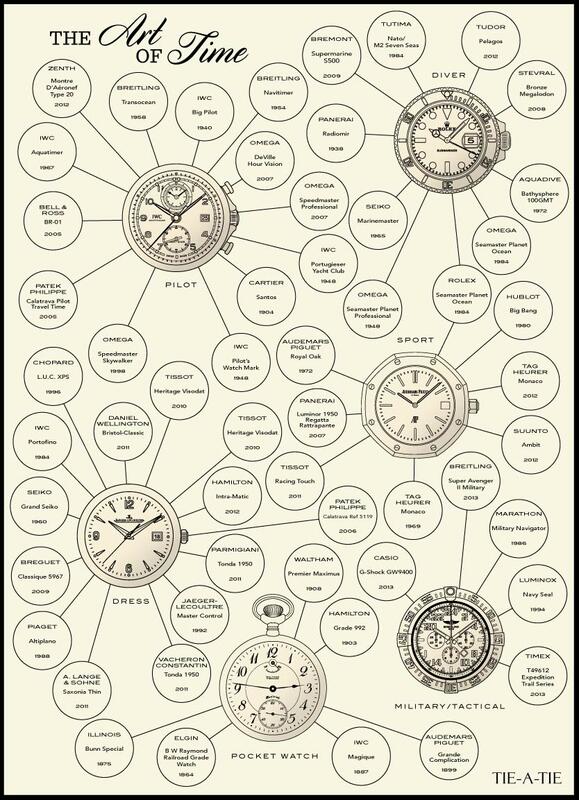 We’ve created an infographic for the men’s watch aficionado! The Art of Time showcases six different styles with 50 iconic models of past and present. See what sets each style apart below. Never miss out on an adventure when you are a proud Diver Watch owner. Originally designed to fill a need for military, explorers, and divers, the watch is now essential for experienced divers, any waterproof need, and good style. With models having the capacity to function in varying depths of 50m to 300m+ underwater, the diver is made to resist the toughest environments.The most defining characteristic is its waterproof quality. Many offer ultra-water resistant qualities including double-locked winding crowns, additional gaskets, and helium escape valves. Another iconic trait is the unidirectional rotating bezel, which usually moves counter-clockwise and allows divers to keep track of elapsed time from a specific point. Most models feature illuminated hands and markers for underwater reading. Designed to meet the needs of those in aviation, the Pilot Watch often contains a busy designs and many features. Typical models include a chronograph (stop watch), slide rule bezel, and multiple-time zone function (GMT). These timepieces undergo tremendous testing to ensure the reliability in various temperatures and gravitational forces. They also tend to be antimagnetic and shock-resistant and will likely be found on a leather strap or steel bracelet. Aside from the technical details, the most important aspect for any pilot is easy readability. Sport Watches have the style and class of a dress watch with mechanical features of a military, a hybrid of sorts. Often watches deemed “sport” are durable, water-resistant with a screw-in crown, luminous markers, chronograph, and made from steel. Designed for the recreational man whether racing, kickboxing, or fishing, the sport watch was made to combine finesse with an active lifestyle. The Dress Watch speaks for itself with style and sophistication. A minimalist’s dream come true, these watches have a simple thin design with only the essential timekeeping features. Often found on a leather strap, it evokes elegance without the bells and whistles. Designed for the true gentleman who wears a watch for the class and not the accessory, it’s made to slip in perfectly with a suit, jacket, or dress shirt. Durability and rugged don’t begin to define the uses and capability of a Military or Tactical Watch. Designed with features to help inform one while out in the wild or on a secret mission, it stands alone among its other watch comrades.While style is always important, these watches lean more toward functionality than fashion. Some qualities are essential for such an occupation: waterproof, good design, accurate time, and good battery are standard. Other optional characteristics include sunrise/sunset times, barometer, altimeter, compass, thermometer, and GPS. The original handheld timepiece, the Pocket Watch offered individuals the ability to know the time at any point. Made popular in the United States during the days of the railroad, accurate timing was essential for the safety of the conductors. The most notable and obvious trait to the pocket watch is that the watch-dial, often accompanied by a cover, is made to fit in a waistcoat, lapel, or belt loop. Generally these watches were attached to a chain for safe keeping and easy access. The design was simple and the precursor to dress wristwatches. Has this happened to you? You are packing for a business trip but don’t want to take your favorite ties with you out of fear they will get damaged or wrinkles? What’s the point then of having these fancy ties? Don’t you want to look your best and dress to impress for those important business meetings out of town? What you need is the right tie travel case! Below are some tie storage and travel accessories that will not only make sure your ties look like new for years to come, but many of these accessories will also help you organize your tie collection. Read below the graphic to learn the pros and cons for each style. A proper tie travel case is a must have item for anyone who regularly travels with suit and tie. Personally I prefer foldable leather cases that typically hold 2-4 ties. They range from $20 (when made from nylon) to a few hundred dollars when made from exotic leathers with brand name attached. Because these are classic pieces that will never go out of style, they make for a perfect gift as well. One of my favorite ones is this one here by Mark and Graham. Besides these leather travel cases, there are also cylindrical cases designed for single ties. Most of them are made from leather or plastic and are closed with a snap or magnet. Leather is preferred over plastic as plastic cases can break easily. Personally I am not a fan of either. If you own more than a handful of ties, but less than 30 ties, then I suggest you invest in a simple hanger style tie organizer. They are available in all kinds of shapes, but I would recommend one that isn’t too long as, is relatively flat, and made from cedar wood. 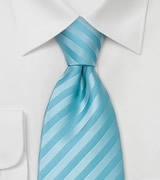 A shorter length (less than 10 inches) keeps it balanced better even when ties are not spread out evenly. A shallow width helps in taking up less room in your closer, and the cedar wood is a great repellant against moths who love to eat silk fabric. This one here by Allen Edmonds is my personal favorite. Are you a tie aficionado who loves to collect fancy neckwear? Then you probably own 50 or even hundreds of ties. If that is you, then a hanging tie rack won’t cut it. 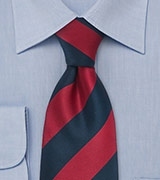 You need something that holds more ties, is easier to organize, and holds your ties better. A mounted rack is the way to go. This one here is perfect! While it only holds 24 ties, you can easily install several in a row or below each other. I have mine installed inside my closet door. If you love your ties so much that you wish you could wear multiple ties each tie, then you may also want to consider one of these wall mounted cubby shelves. While typically only seen for store displays, they can be a piece of colorful art in your walk-in closet. Personally I am not a big fan of using drawer inserts as most of them require you to roll your ties and then placing the cylinder shaped roll upright. 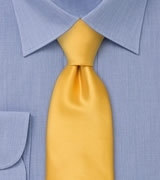 This can negatively impact the shape and drape of the tie. But, if you have an extra drawer available, have limited hanging space, and are tired of your ties falling off from the tie rack, then a drawer insert might be right for you. Choose an flexible fabric insert that is adjustable to fit a wide range of drawers. This one here by the Container Store is a good option that can be adjusted to fit a wide range of drawer dimensions. Do you love to read Sky Mall, step into a Brookstone store every chance you get, and are a sucker for gadgets in general? 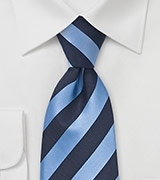 Then you might be the right candidate for a battery powered rotating tie rack. 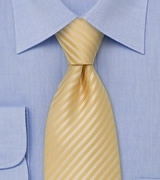 They typically mount on a clothing rod and hold upwards of 30 ties. Most of these racks also have an LED light. The downside of these racks is that they require you to change batteries occasionally, they take up much real estate on your clothing rod, and they tend to break easily as most of the ones I have come across are cheaply made. 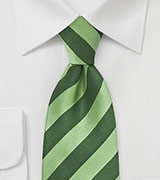 Still convinced that you want to organize your ties this way, then I found a good option here on Overstock.com. While most of my posts are related to men’s neckwear, a reader recently asked what type of briefcase he should get for a new job as an accountant. Inspired by this great question, I decided to create an infographic with all the most common types of men’s bags, briefcases, packs, and “murses”. Besides covering what each looks like, this visual ranks each bag on comfort, tells you common uses, and more. Suspenders have seen quite the comeback in mens fashion. What was once a necessary clothing item one-hundred years ago, a time when pants had no belt loops, is nowadays a fashion accessory that blends both function with style. Just like there are different tie fabrics, suspenders are commonly made from leather silk, synthetics, linen, cotton, and elastics. In addition, they come in any pattern and color. Just like when picking out a tie, you need to keep your outfit and the occasion in mind when choosing a pair of suspenders. Solid and darker colors are most formal, while wild patterns and out-of-the-ordinary materials (leather, linen, and cotton) are better suited for casual wear. Connectors: Look for the button attachment style. Material: Choose Jacquard silk, cotton, or elastic fabric. If you opt for silk or cotton, make sure that a section of elastic is added on the back for more comfort. Color: Choose darker colors that are more versatile such as gray, charcoal, or navy. Pattern: Keep patterns minimal. 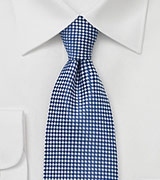 Besides solids, monochromatic ribbed texture, tiny pin dots, or monochromatic micro checks are good options. For the most part, suspenders are either attached using metal clips or buttons (see graphic above). Just like a bow tie aficionado will insist that the “self tie bow tie” is the only sartorial acceptable choice, suspender proponents will argue that buttoned suspenders vs clip-ons will differentiate the man from the boy. If you are unsure that you will like the “suspender look”, I would suggest you try a pair of less expensive suspenders, that are attached using clips first, before investing in a high end piece that requires that not only costs more, but also will require a trip to a tailor to get suspender buttons added to your trousers. Got any tips, thoughts, and/or suggestions regarding suspenders? Then leave a comment below! Thanks for reading! However, black tie does allow you to personalize your look. In this post I am discussing different jacket styles that stand out thanks to a unique cut, color or tailoring detail. The single-breasted tux is the most common style. Almost always this is the style that is available to you at tuxedo rentals. It is a timeless look that makes up the “Gold Standard” of classic black tie dress. The double-breasted tux is one of my favorite looks. To me it has a very unique, gentlemanly, and masculine elegance. The key to a good looking double-breasted tux is in the tailoring. The jacket needs to fit perfectly at your shoulders, taper at the waist, and be cut to the right length. Because most double-breasted tuxes feature wider lapels these jackets look excellent with a larger butterfly bow tie (read about different bow tie styles here). 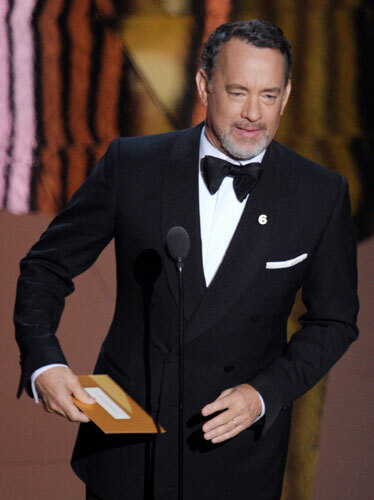 Two great examples where this is done just right, can be seen on Tom Hanks as well as Tom Ford. If you are looking for a modern cut tux that is tailored with a slimmer silhouette, then this is the style for you. Because of the narrow notch lapels these tuxes look best with standard butterfly or narrow batwing bow ties. Also, they look fantastic with solid skinny black neckties – creating a more modern, trendy, and slightly more casual black tie look. That being said, it is a perfect look for “black tie optional”, or “black tie preferred” invitations. Another excellent pick for the fashion forward and modern man is the single breasted tux featuring a narrow shawl collar. 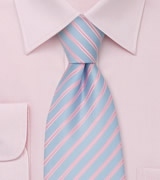 It can be worn with standard black bow ties as well as slim black neckties. Lapel flowers are not suited for this jacket style. Instead choose a solid white pocket square. Chances are you will be one of the only men wearing a double breasted shawl collar tux at the event! If you want to stand out with your impeccable sartorial wardrobe choices, while perfectly adhering to a strict black tie dress code, then this is the jacket for you. 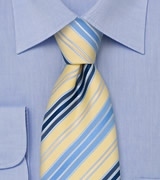 It is best worn with cummerbund, formal un-pleated dress shirt, and a white pocket square. 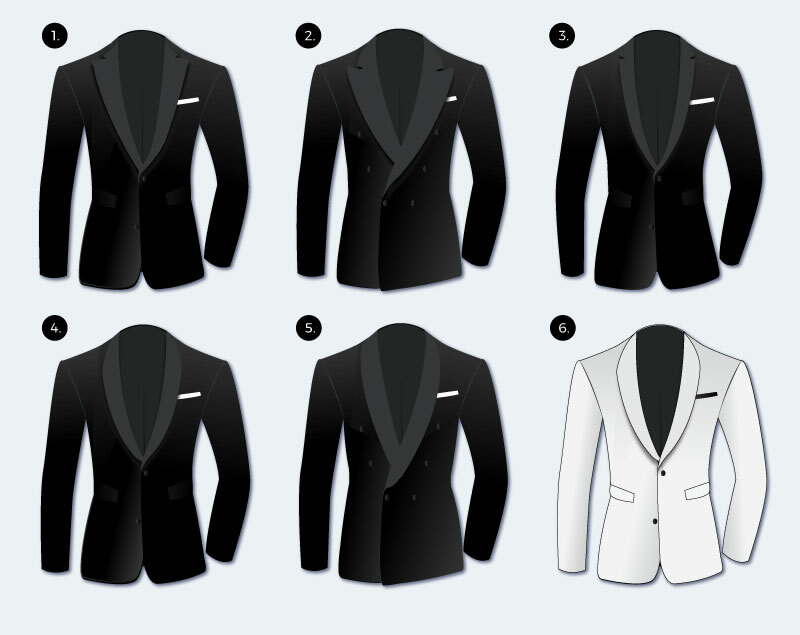 The white tuxedo jacket is worn for so-called “Warm Weather Black Tie”. As the name suggests, it is a formal black tie event taking place in warmer climate during the day. The white dinner jacket comes in single and double breasted cuts, as well as any lapel style. It is considered a faux pas to wear it with a waistcoat. Instead it is paired with black pleated cummerbund, white formal shirt with onyx studs, black tuxedo pants, and patent leather dress shoes.